Disney Hipster Blog: Keep On Singin Gilly! One of the upsides of being a truly obsessive person, is finding hidden gems in the lexicon of American culture that I can obsess over 50 years after their hay day. Such is the slow descent into being obsessed with Eddie Hodges. Sure, I've been mildly smitten for Eddie since my mother introduced me to Summer Magic while I was still in diapers. 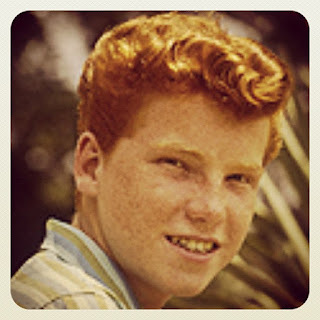 He has always stayed that way in my head, as Hayley Mills annoying, snarky, musically talented little brother, Gilly. Little did I know that Gilly Eddie was, for a period, just as big a star as Hayley. At ten years old he was part of the original Broadway cast of The Music Man, which is responsible for some of the best music on Main Street USA! With that said, I think it could be argued that Eddie is the most prominent person on the Main Street audio loop. Between Summer Magic and The Music Man there are five songs (at least). Adam and I have also become completely swept away by a collection of Eddie's pop songs that we found on iTunes. Best known for a song called "I'm Gunna Knock On Your Door," Eddie recorded several dozen amazing and weird pop songs. When I say weird, I mean truly, utterly, blissfully bizarre. From a song writing perspective (you guys knew both Adam and I have a background in music...right? ) these songs are super interesting. The lyrics are walk a fine line between sappy and campy. I'm just waiting for The Magnetic Fields to do an Eddie Hodges covers album. (best idea ever.) Also of note is Eddie's small role in The Happiest Millionaire...another Disney classic.